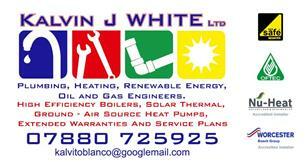 Kalvin J White Ltd - Central Heating Engineer, Plumber based in Upton, Cornwall. Hello, Kalvin J White has been a plumber and heating engineer for over 23 years being fully qualified and having carried out a full 4-year apprenticeship. Kalvin J White Ltd Plumbing, Heating and Renewables has been trading for 10 years. We carry out a wide range of plumbing and heating work including: new boiler installations, boiler changes, full central heating systems to radiators, unvented hot water cylinders, underfloor heating, boiler servicing, all types of renewable energy, bath/shower rooms and smaller jobs such as new taps, toilet syphons, motorised valves or leaks to existing systems etc. Our work also includes all types of system design i.e. linking 1 or more boilers, cylinders together, plant rooms and underfloor heating to get the most efficiency out of your new or refurbed system. We work with gas, oil, LPG and renewables; holding Gas safe and Oftec qualifications. We are always looking to keep up with new and efficient technologies. Our current work sees us working with private customers, a few choice local builders, farmers and some high street businesses. We are Worcester Bosch and NU-Heat accredited installers and can offer extended warranty's and yearly service plans. Please don't hesitate to contact us on 07880725925 for a free quotation and advice. Look forward to hearing from you soon.